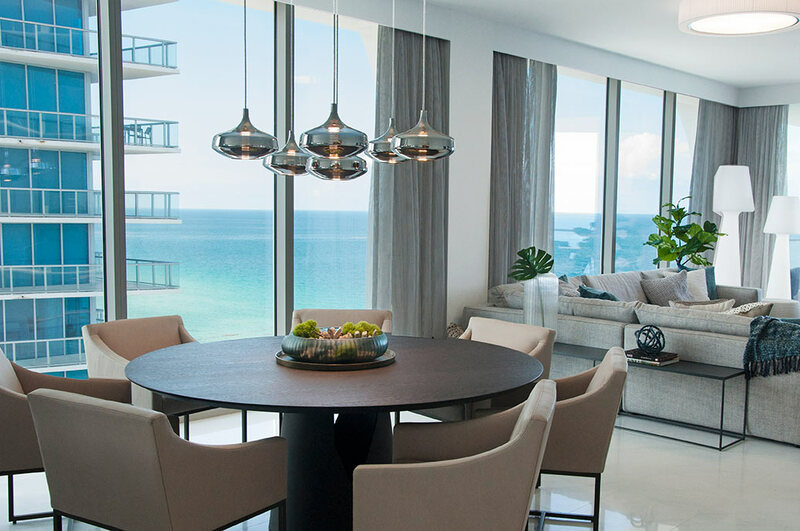 We’ve been sharing the process of our Sunny Isles condo design project with you for a few months now—we’ve written about the design concept and even the bedrooms. Well, it’s nearing time for the big reveal, but not just yet! 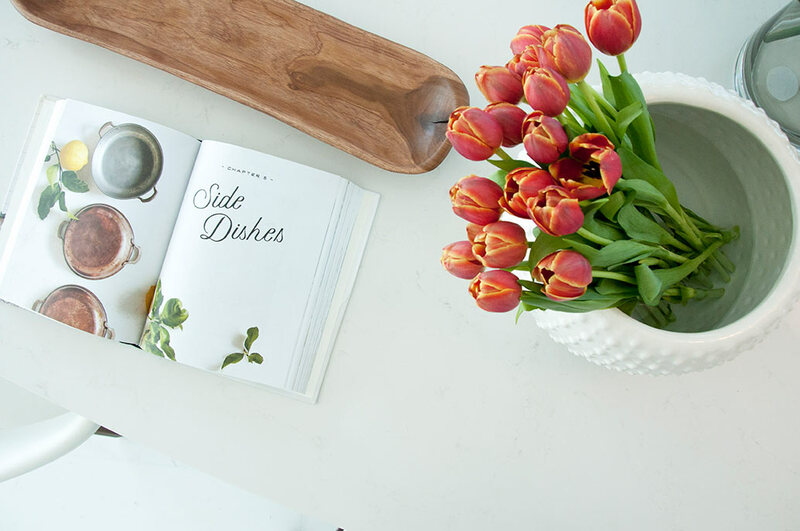 Today, we’re sharing the small accents that have a big impact on our design. For a smaller entry foyer, it’s important to choose a console that doesn’t take up too much space but is still functional. We found this stunner of a glass-and-wood table that feels light and airy, but with an earthy undertone. 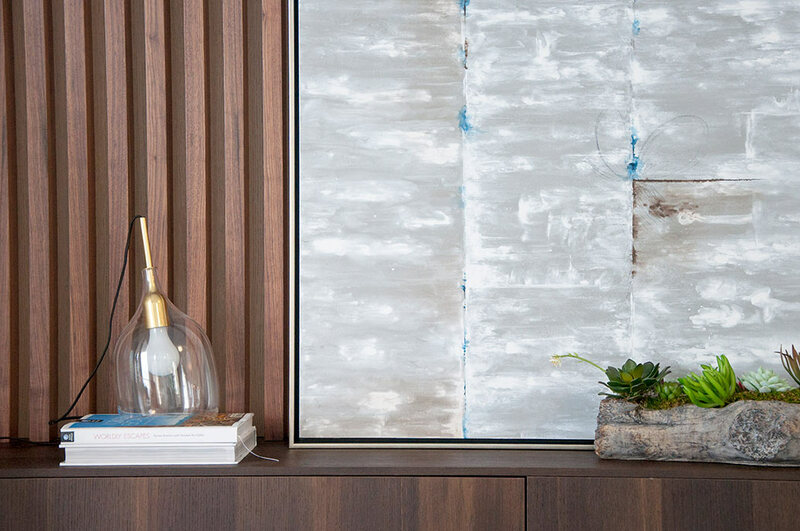 Our designers accessorized the console with items that speak to the sea-worthy design: a blue-tinted glass vase from Amara mimics the ocean, while a weathered stone wheel adds height and a distressed vibe. To maintain the space’s functionality, we included a decorative bowl from Global Views —the perfect spot to your drop keys. 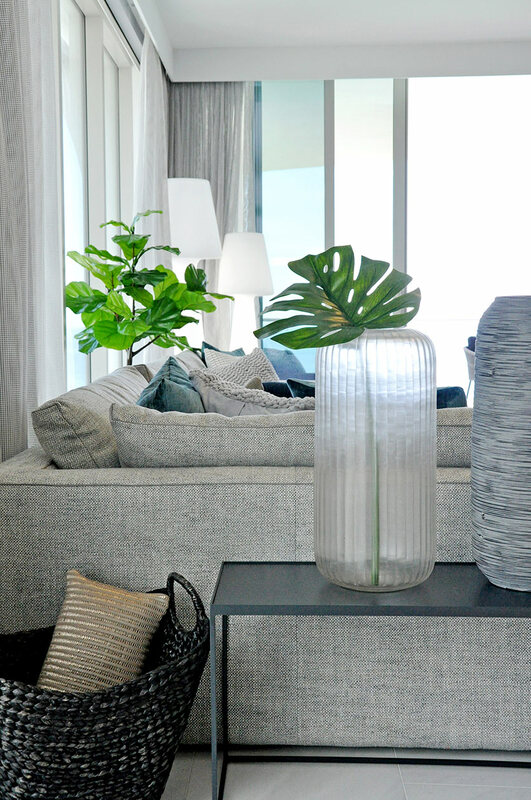 One must have, especially for condo design projects that lack a front or backyard, is greenery. It adds warmth and life to any space. But don’t worry if you don’t have a green thumb, a good faux plant will do the trick. We like this fiddle leaf fig from CB2 because it has a good size and an even better price. 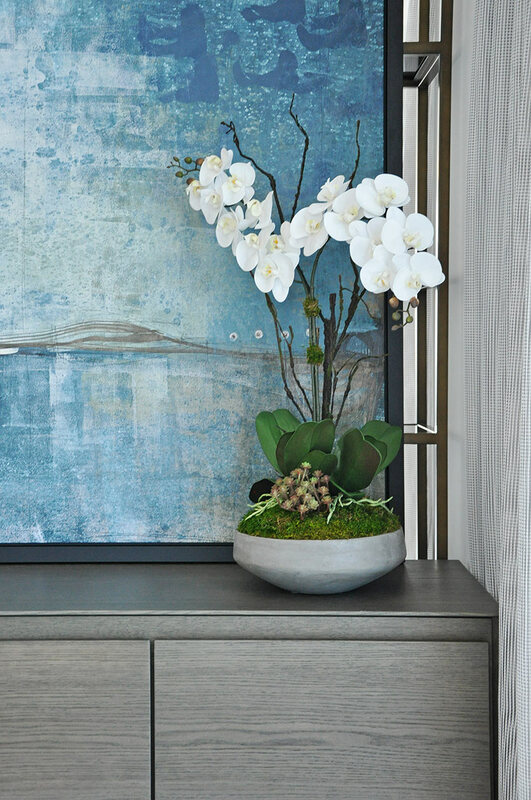 It’s important to infuse a touch of the homeowner’s personality into the design of a foyer to give visitors the right first impression. 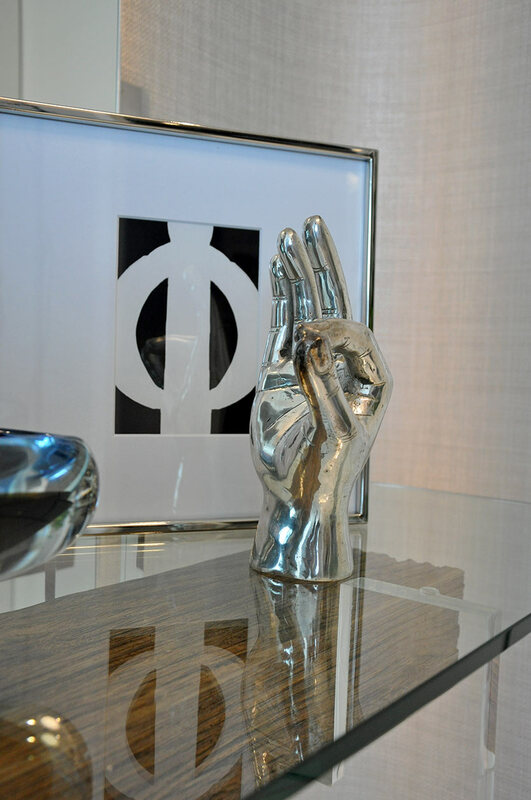 We did this with this chrome hand sculpture; it’s flashing the “OK” sign to let you know that everything’s going to be all right. 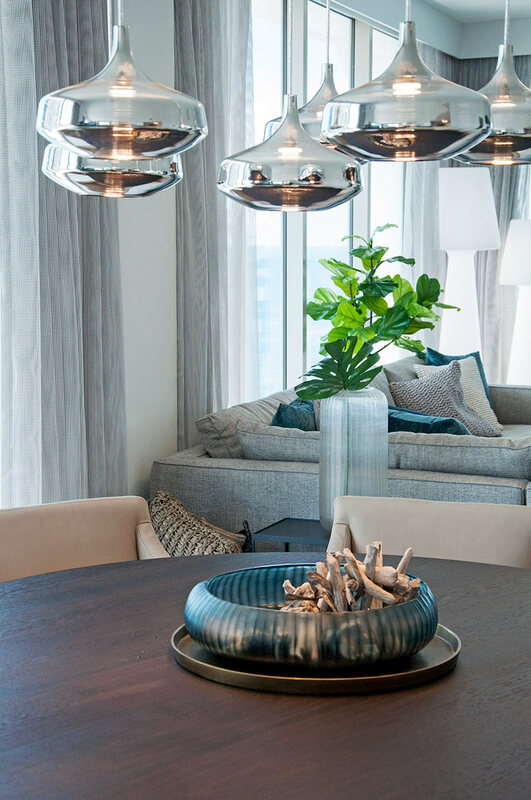 As you continue into the living room, you’ll notice it’s really all in the details, especially the lighting elements. 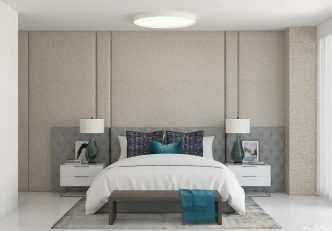 It can be difficult to find good size and quality options for flush-mount lights for common rooms, like this living space. 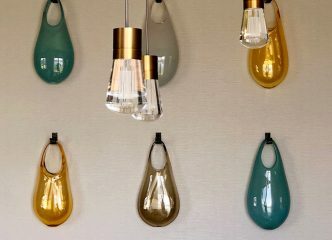 But, our design team searched far and wide and found this one from Bover. It’s not only high-quality, but it has the right texture and dimension for the room. 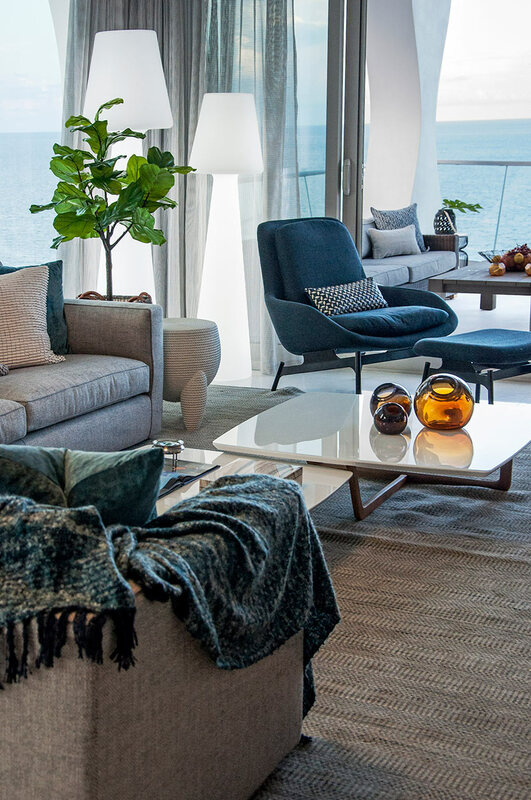 Since our condo design project is inspired by the journey of sailing from one destination to the next, we were inspired to create a chic indoor-outdoor feel in the common spaces. Behind one of our favorite navy Bludot chairs, which gives the room a bold pop of color, are a pair of modern floor lamps. And guess what? They’re outdoor lamps from ArtKalia. We love doing things that are a bit unexpected, especially when it works out this well! 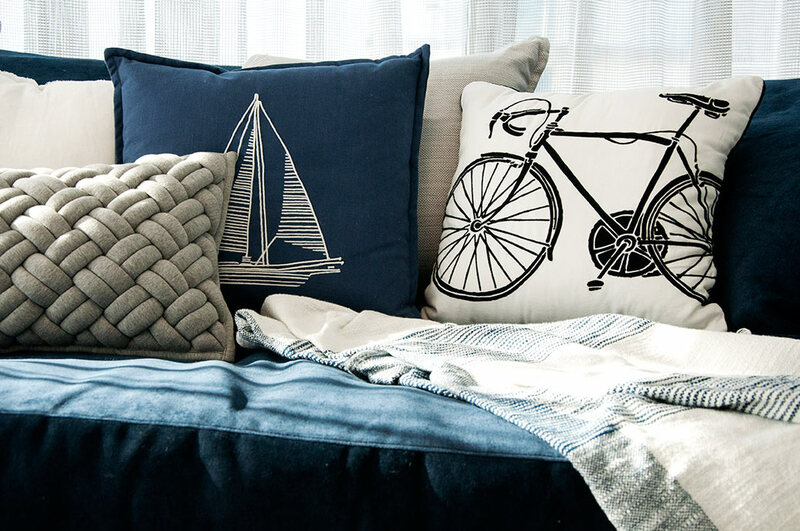 In a living room, it’s key that the pillows and blankets are cozy, comfy, and stylish. 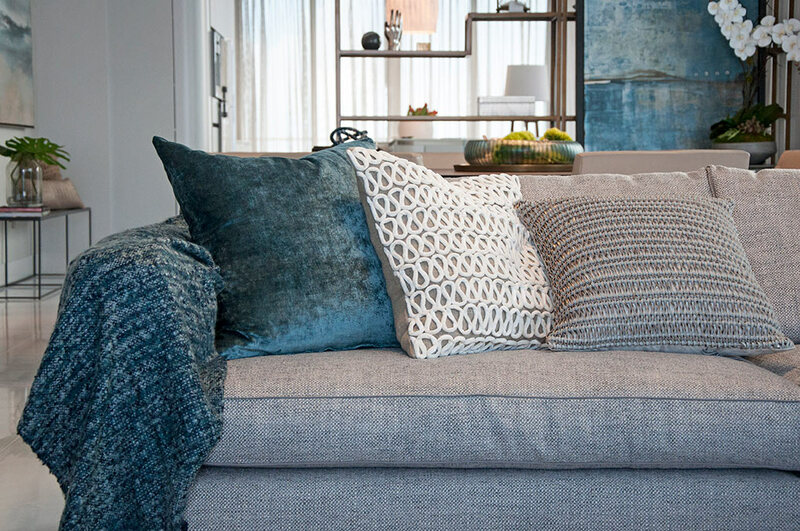 We love the depth and interest the different textures of the pillows bring to the sofa. 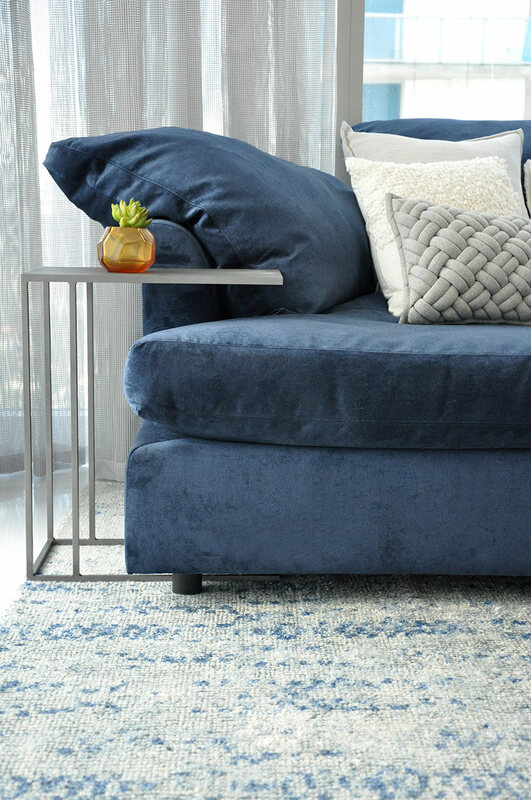 From the velvet loop pillow from Arhaus that would blend into the sofa if not for its deep texture to the custom dark blue pillows we had created by the same company who made the sofa, each pillow is begging to be cuddled up with. Across from the sofa is a custom TV cabinet we dreamed up just for our client, because if you’re going to have a TV in the room it should be surrounded by great design (right?!). The warm wood slats, constructed by a favorite carpenter or ours, were the perfect earthy and rich first layer. We topped this beautiful focal point with a table lamp that creates cool reflections, an art piece for a pop of color, and succulents potted in driftwood to complete the vignette. 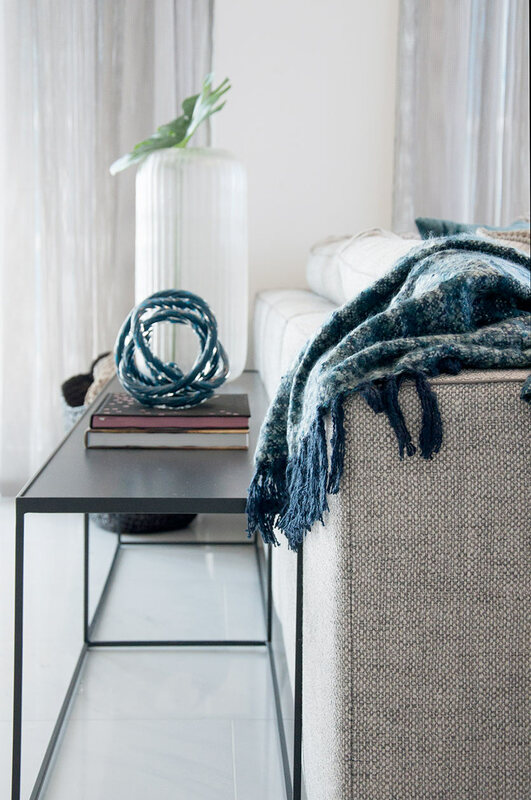 With every addition to the sleek, mostly neutral space, we added texture. A woven basket next to a smooth metal table. 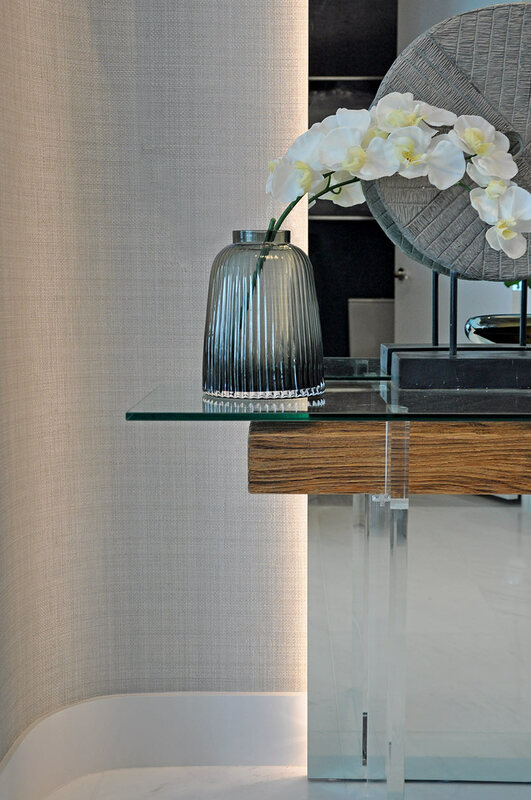 That same table is topped with a ribbed glass vase or a yarn-like glass sculpture—all adding richness to the design. 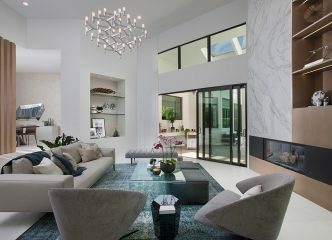 In an open-concept space, it’s important that all of the little details fit together to create the right look and feel. 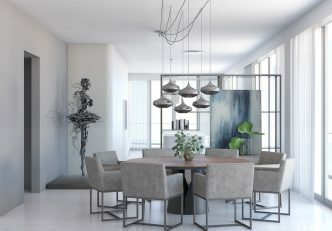 Clustered over the dining table, visible just over the living room’s sectional sofa, is a grouping of Nostalgia Light pendants that casts a stunning reflection on the ceiling, giving the space a real wow-factor. 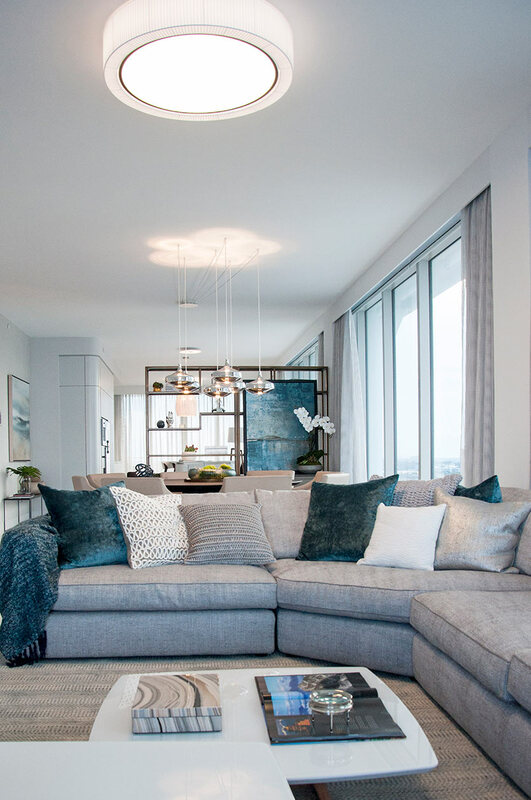 The chrome finish pulls the sleek gray color from the sectional sofa, tying the spaces together. The calming blue abstract painting and bowl atop the dining table mirror the blue on the accents in the living room, continuing the connectedness of our design. 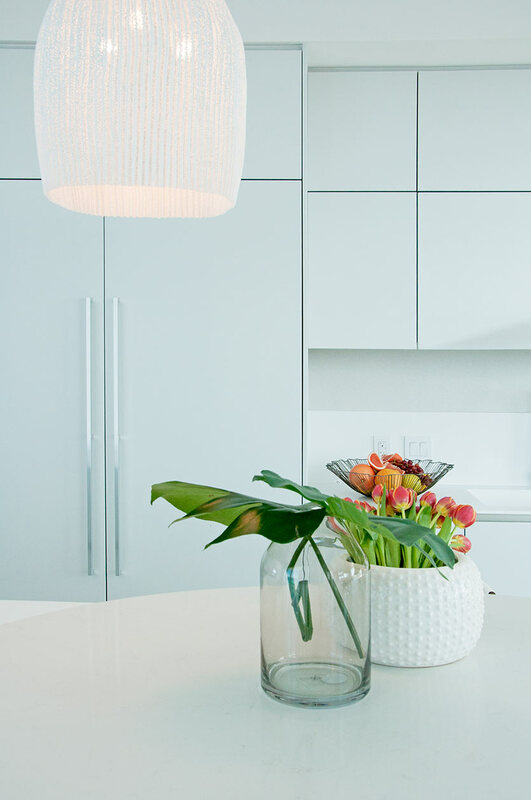 Walk past the dining room to find a crisp, white, modern kitchen. 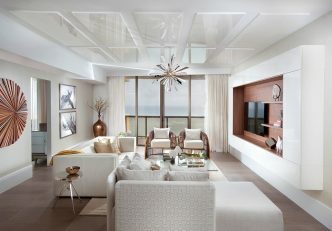 We’ve carried the wood finishes over from the living and dining spaces to lend warmth. 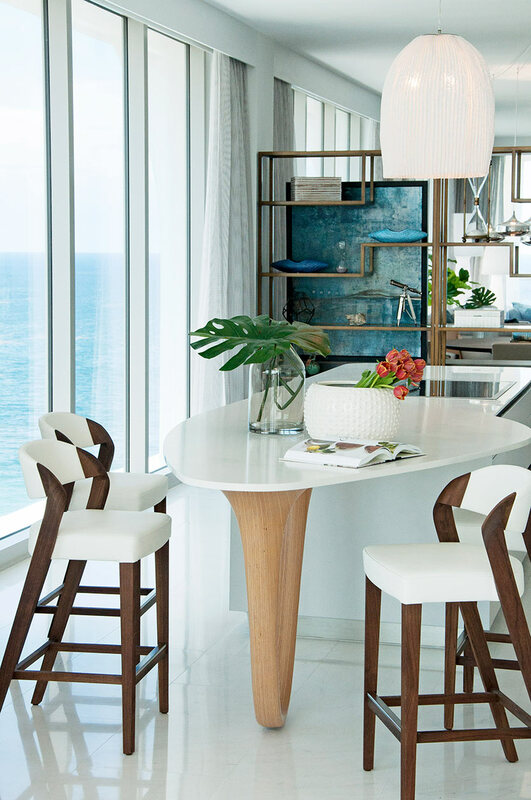 While the bar stools and the island are reminiscent of captain’s chairs and a ship’s bow respectively, it’s really the pendant light from Arturo Alvarez that catches our eye. Its design recalls a sea creature; and we love it! 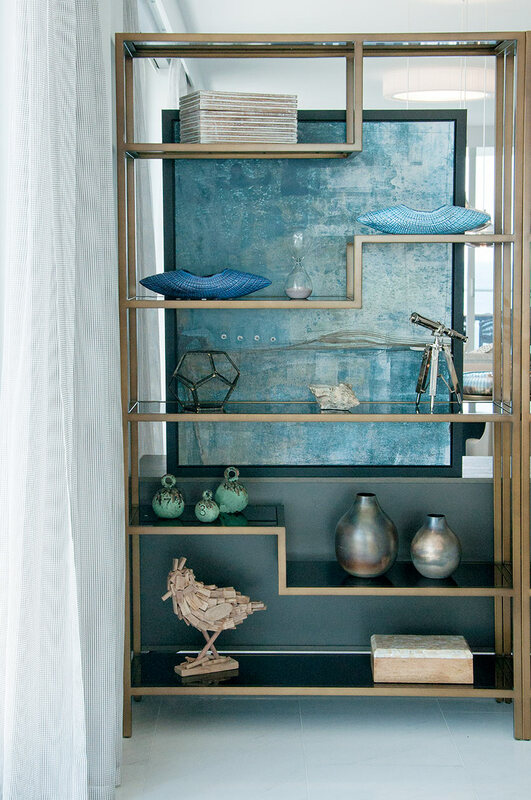 The same blue painting that can be seen from the living and dining rooms can also be viewed in the kitchen, but in a fun twist: It’s behind the shelves we added to the space. Every little trinket reinforces the color palette and the design concept—especially the mini telescope and all of the seashells. 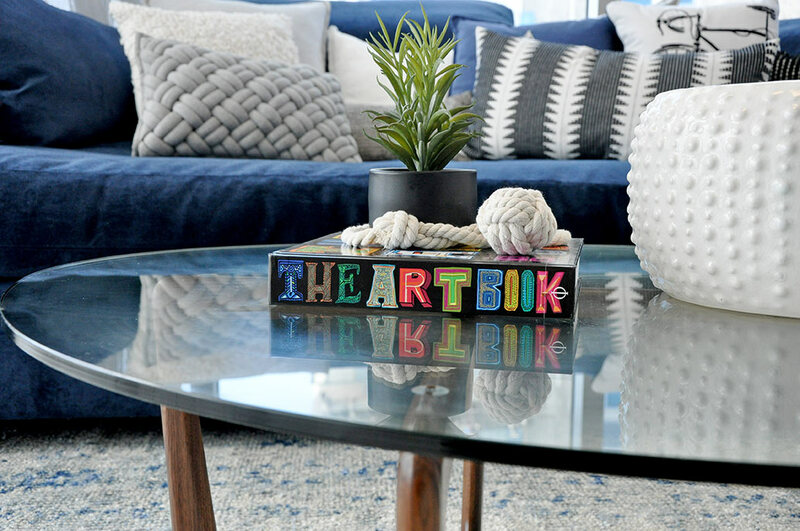 A sea of calming blues fills this family-friendly room, from the dark blue sofa to pillows that top it. We love designing family rooms because they offer us the opportunity to have even more fun and be a bit more straightforward with our design concept. For example, the woven pillow that mimics a sailor’s knot pairs perfectly with a boat-adorned cushion, which might be too much for a common area where our client would be entertaining. But in the family room, it’s just right. And we’ve taken it a step further, the vase on the coffee table reminds us of a sea urchin, and there’s an actual sailor’s knot next to it! Now that you’ve gotten a sneak peek, are you as excited as we are for the big reveal? We certainly hope so. 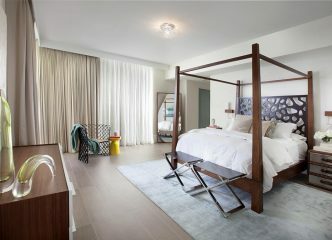 Check back soon for all the looks in this sailing-inspired condo design project.